I remember saying in one of my previous posts that all Romanian soups are pretty much sour except the chicken noodle and then I realized it is not entirely accurate. 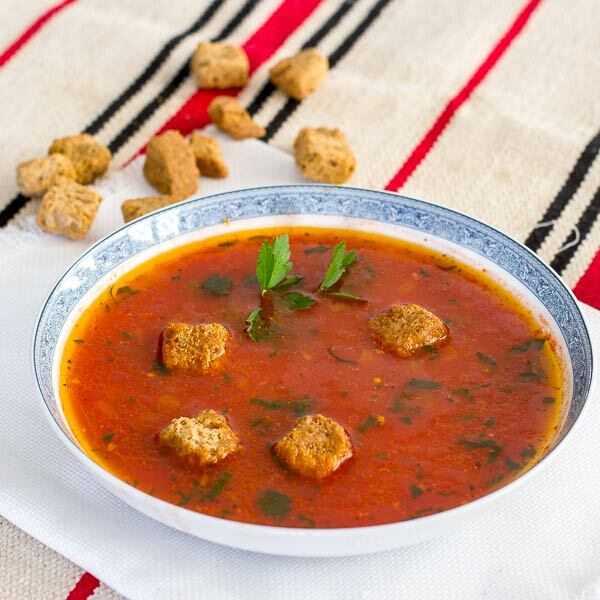 Take tomato soup for example, it is sweet and fresh and though I used to enjoy a cold bowl mostly during summers, I recently found out that can be equally delicious served hot on cold winter days. It is pretty easy to prepare, like any other soup, you can’t go wrong with anything when making it. Ingredients quantities are flexible in most cases, it all depends of how rich or how much soup you want in the end (number of servings). Those little croutons that you see in my image are store bought so don’t even bother with making them, the ones that I found were whole wheat and with caraway seeds, which I must confess, gave a new meaning to the whole thing. Now, there is another way of making the soup if you use fresh tomatoes but it is not that hard either, just a bit time consuming. When using fresh tomatoes, they need to be peeled before, which you can accomplish easily by throw them in boiled water for few seconds. One other thing, some people like it creamy and they mash the veggies using a hand blender but I personally hate it, I like it clear and “thin”. Clean and chop your veggies to the size that you know you like, mince the garlic then throw everything in a heated soup pan in which you added a tablespoon or two of olive oil. Cook until softened then add a cup of water (250 ml), basil, bay leaves and thyme and let them cook on low heat. When veggies are almost done, remove basil and bay leaves and pour in the crushed tomatoes. Add a tablespoon of sugar to counteract the tomatoes acidity, salt and pepper to taste and fill the pan with water until you reach the desired consistency. Make sense? Cook for 15-20 minutes on medium heat and enjoy either cold or hot.